Round Table: "There's No 'I' in Team"
McCritic: When Izzie said to Alex: "I care about you, and I'm not gonna go crazy, and I'm not gonna try to kill myself and I'm not gonna stop caring about you no matter how hard you push me away." I'm sorry. Didn't Izzie already go crazy when she broke up George's marriage to Callie? missingBurke: Izzie's Good Will Hunting-esque "I care about you, I care about you, I care about you ..." That scene was really powerful and I like them together. iheartizzie: After his intern referred to him as O'Malley and leaves, I loved George's meek reply (to no one in particular), "He probably should say Doctor O'Malley." Vintage George. As for whether Lexie going off on him was warranted, see next question. 2. Is Dr. O'Malley really a jerk or was Lexie out of line? iheartizzie: George is unbelievably clueless if he can't pick up her signals, and why he didn't explain to her that he didn't ask for any interns is beyond me. But he's no jerk. As a venerable Lexipedia, young Grey should know that you have to be particularly overt with George or he won't take a hint. You can't get mad at O'Malley for being O'Malley. McCritic: With Meredith maturing, I guess the show needed one Grey sister to enter Irrational Land. Lexie was very much out of line. And would you even wanna be an intern for the man you're in love with? Might lead to seriously - seriously! - awkward situations. missingBurke: I'm with Lexie. It's one thing to not realize someone has feelings for you, but ignoring the poor girl is quite another. He made her feel invisible. 3. Was Derek ungrateful to Meredith or did he have a point? missingBurke: I liked this story line because they both had good points. Derek should have been sensitive to how Meredith would react, but in his mind he is the attending and that's pretty much it. He can be stubborn sometimes, but as usual, McDreamy came around having thought it over a little. McCritic: Meredith went too far when she referenced the "Shepherd-Grey" method. She already has a show named after her. Isn't that enough? iheartizzie: Derek is the attending, sure, but since it wasn't even his idea to do the clinical trial, that argument is weak. Fortunately, Bailey talked some sense into Derek and - ever the romantic - he made amends with the timeless gift of a diseased kidney. 4. Will Callie and Erica last or fizzle out? McCritic: I'm fully aboard the Horres bandwagon! While skeptical of the sudden lesbian angle at first, the show has handled this relationship in a realistic manner. iheartizzie: The unfamiliar terrain makes this difficult to handicap. A lot may depend on the effectiveness of the famed Sloan method. The man's a genius, after all. 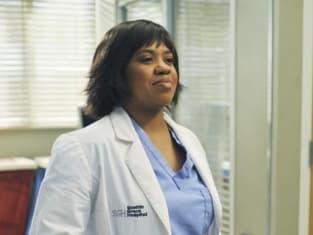 missingBurke: Callie has more chemistry with Mark. I see these casual lovers turned BFFs ending up together. 5. Is it too late for Izzie and Alex? iheartizzie: No. They've had great chemistry from the start, and the way they're growing closer - or appear to be - makes a lot of sense, and the pacing feels just right. missingBurke: No. They may still have a future as a couple. But it is too late for Alex to be Izzie's soulmate, as Denny wrapped up that title years ago. McCritic: Yes. If only because there's no coherent nickname for these two. Azzie? Ilex? Nothing works. What do you think of Alex Karev and Izzie Stevens as a couple on Grey's Anatomy?